Engelsk semesteropgave i engelsk om et praktikforløb til en 5. klasse. 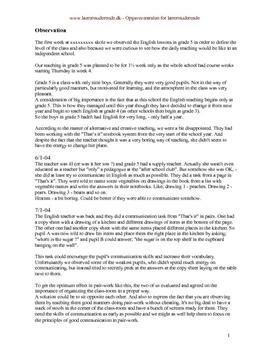 Practice report in grade 5. Observation, Lesson plan and didactic reflections. The first week at xxxxxxxxx skole we observed the English lessons in grade 5 in order to define the level of the class and also because we were curious to see how the daily teaching would be like in an independent school. Our teaching in grade 5 was planned to be for 1½ week only as the whole school had course weeks starting Thursday in week 4. Grade 5 is a class with only nine boys. Generally they were very good pupils. Not in the way of particularly good manners, but motivated for learning, and the atmosphere in the class was very pleasant. A consideration of big importance is the fact that at this school the English teaching begins only at grade 5. This is how they managed until this year though they have decided to change it from next year and begin to teach English at grade 4 (as other schools then begin at grade 3). So the boys in grade 5 hadn't had English for very long, - only half a year. According to the matter of alternative and creative teaching, we were a bit disappointed. They had been working with the "That's it" textbook system from the very start of the school year. And despite the fact that the teacher thought it was a very boring way of teaching, she didn't seem to have the energy to change her plans. The teacher was ill (or was it her son ?) and grade 5 had a supply teacher. Actually she wasn't even educated as a teacher but "only" a pedagogue at the "after school club". But somehow she was OK, -she did at least try to communicate in English as much as possible. They did a task from a page in "That's it". They were told to name some vegetables on drawings in the book from a list with vegetable names and write the answers in their notebooks. Like; drawing 1 - peaches. Drawing 2 -pears. Drawing 3 - beans and so on. Materialer relateret til Practice report in grade 5.